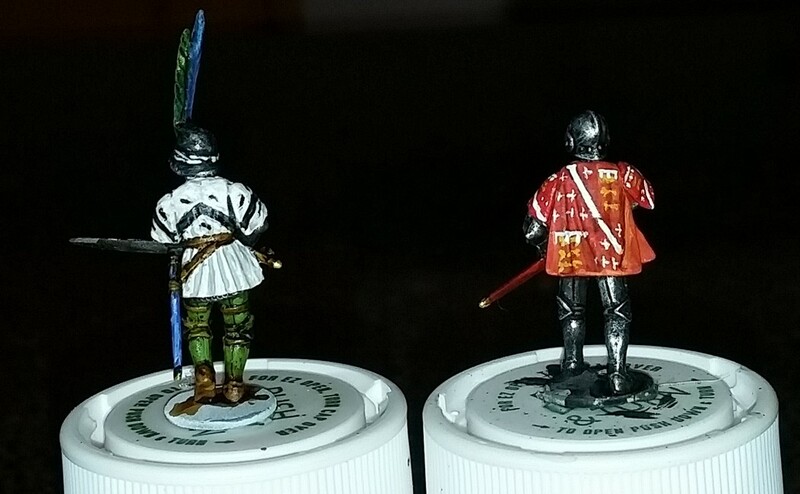 These are the command figures from the Perry Foot Knights box. 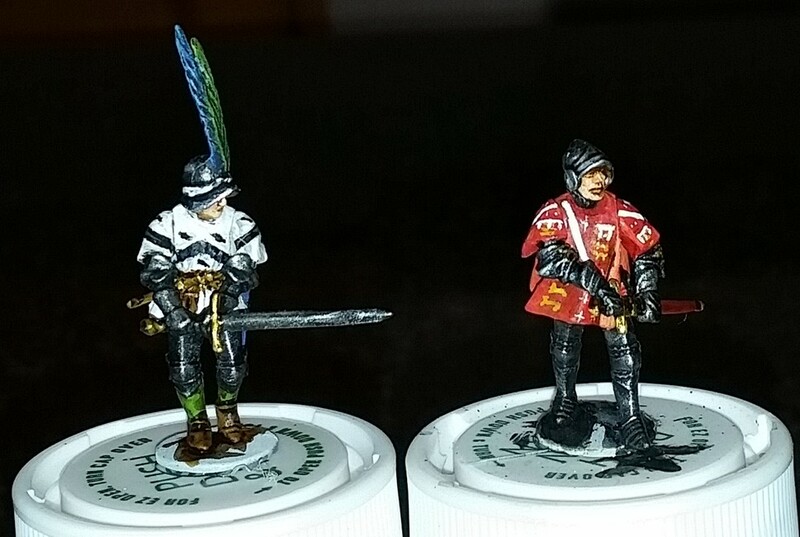 The figure on the left is painted up as Rhys ap Thomas, a Welsh supporter of Henry Tudor who fought at Bosworth. 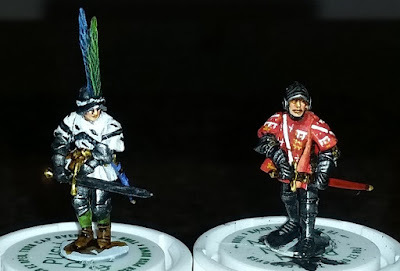 The figure on the right is painted up as John Howard, 1st Duke of Norfolk, who fought and died for Richard III at Bosworth. The Rhys figure is supposed to be the standard bearer; the feathered sallet head is from the Light Cavalry set. 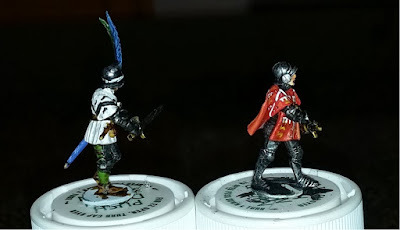 The arms for Rhys ap Thomas include a chevron with three black crows - which are painted for effect rather than accuracy. John Howard's arms are bit more elaborate: Quarterly: 1 and 4, gules a bend between six cross crosslets fitchée argent (for HOWARD); 2, England with a label of three points argent; 3, gules a lion rampant argent. According to some sources, it was Rhys ap Thomas who countered the attack by the Duke of Norfolk in the opening phase of Bosworth. Heraldry charges are painted for effect rather than accuracy. These plastic kits are great for customizing with head and arm swaps. Rhys ap Thomas was knighted on the field of battle at Bosworth and continued to be a loyal supporter of King Henry VII. The Duke of Norfolk was killed by an arrow to the face - after his visor was torn off fighting against the Earl of Oxford. Incidentally, the Duke was the great-grandfather of Anne Boleyn. According to Shakespeare, the night before the battle a note was left in the Duke's tent which read, "Jack of Norfolk, be not too bold, For Dickon, thy master, is bought and sold." Wow, Dean! The heraldry you have worked up on Howard's cape is outstanding! The pose of Howard drawing his sword reminds me of photos of yourself in full metal jacket. Do you see a resemblance? Excellent work on Heraldy Dean! Superb work Dean, the coat of arms on both figures is outstanding! Great work Dean especially the freehand heraldry! Stunning work on these guys Dean! Lovely heraldry, they really are great to modify aren't they? Fabulous love the sculpts as well. I really like the drawing the sword pose its quite dynamic. Great work on that Heraldry! 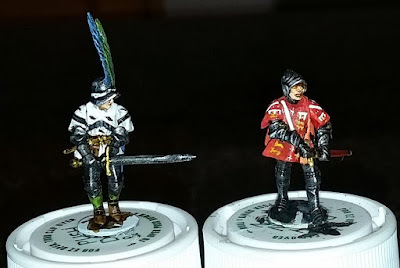 I loathe painting such things and always admire those who have the skills to do heraldry justice. 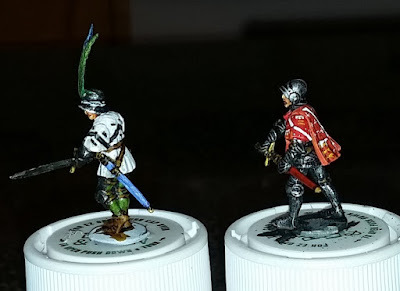 Late to the party but not to late to say great work on the surcoats! Hello!! I'am glad to read the whole content of this blog and am very excited.Thank you.